As you prepare for your beach vacations and fun in the sun, are you properly protecting your skin from skin cancer? Can black people get skin cancer? I'm going to share skin cancer symptoms and signs to help you raise your awareness about this disease. 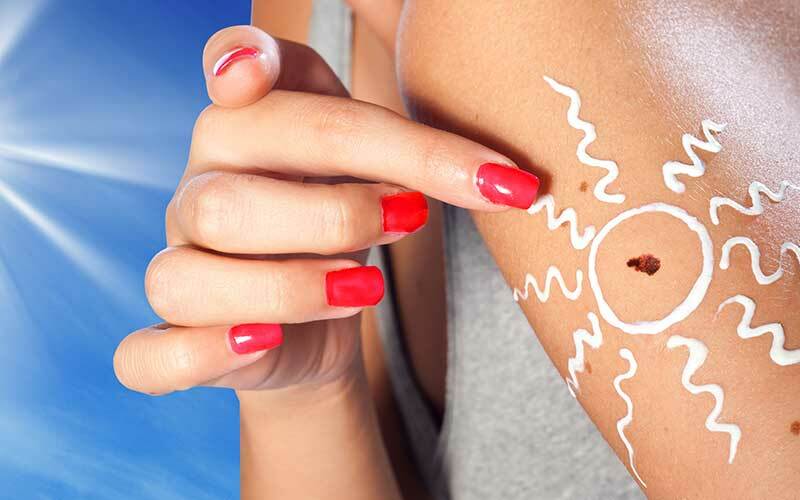 Do You Know Skin Cancer Symptoms and Signs? There are two types of skin cancer, non-melanoma, and melanoma. There are two common causes of non-melanoma skin cancers. They are basal cell carcinoma and squamous cell carcinoma. People who have fair skin and who have a lot of exposure to the sun are at the highest risk for skin cancer. Anderson Cooper of CNN reported that he had a spot of skin cancer removed. Fortunately, his cancer was removed early enough so that it had not spread. Anderson's skin cancer was in his face. The most common locations for non-melanoma skin cancers are in the face, chest, neck, legs, arms, the back of the hands. Basically places where you have a lot of sun exposure. Melanoma is a type of skin cancer that can show up in places that are harder to see on the skin, like on your back or the inside linings of your mouth or even under your feet. Melanoma tends to be a more aggressive type of skin cancer. It can present with different colors on your skin, black, brown, bluish. It tends to have jagged, irregular edges, and it can be uneven or asymmetric. Melanoma can even look like a black dot when it first appears. Indeed, excess sun exposure does put you at increased risk for skin cancer, but so does an increased exposure to tanning beds. Andy Cohen of Bravo and the Real Housewives franchise used to be a self-proclaimed "tanorexic." He once had a black dot on his lower lip and his friend, Kelly Ripa, noticed it and she urged him to see his doctor. That black dot turned out to be melanoma. In my medical practice, when I counsel on sun exposure and skin cancer symptoms and signs, I've had more than one of my "know-it-all patients" ... and you know who you are ... tell me, "Dr. Frita, why are you telling me this? Black people can't get skin cancer." Not true. The legendary Bob Marley had skin cancer, melanoma. It actually started out as a dark spot that he saw under his toenail. He just thought it was an injury from playing soccer. But as it turns out, it was melanoma, and he died at the age of 36. It just goes to show you, no matter what your color, your ethnicity, your culture, it's important that you pay attention to your body, that you examine your own skin and make note of any changes. How do you diagnose a skin cancer? You go to your physician. Your physician will examine your skin all over, and if they see any type of a lesion or a mole that looks suspicious, then they will set you up for a biopsy or they will sample that lesion. Your doctor will then send that biopsy or that sample to another type of physician, a pathologist, who will examine that biopsy under the microscope. If it looks like skin cancer, then they will make that diagnosis. How can you prevent skin cancer? Well, the most important thing is to try to avoid too much exposure to the sun. Try to avoid the sun during peak hours, like between 10:00 a.m. and 4:00 p.m.
Also, avoid tanning beds. Most tanning beds emit UVA radiation, which can be harmful to the skin. Another thing to do, if you can't avoid the sun, which most of us can't, make sure that you protect your skin. You can protect your skin by wearing a broad spectrum sunscreen that protects against both UVA and UVB range radiation. Make sure that the SPF, the sun protection factor, is at minimum 30, but if you have fair skin or if you're going to have prolonged exposure to the sun, you need to use an even higher SPF. Also, wear wide-brimmed hats and wear shades. Put on a nice thin clothing that will cover your arms and your legs. Be sure you reapply your sunscreen frequently, especially if you go swimming or if you've been wiping your skin down or if you've just been out for more than a little bit of time. Can Black People Get Sunburned? From personal experience, I can tell you yes. When I was in the sixth grade here in sunny Florida, I was at a soccer camp, and we were outdoors all day, every day for one week. Well, I learned that I was wrong that week, because by the end of the week, my skin was a peeling, painful sunburned mess, and I looked like a chocolate covered crocodile. So yes, black people can get sunburns, so it's important for everyone to protect their skin from the sun. This ends my overview of skin cancer symptoms and signs and sun protection. I want you to comment down below and let me know about your experiences with sunburn or skin cancer. As always, I want you to prioritize yourselves. As you enjoy the summer and the sunny beautiful weather, make sure that you remember your health and that you protect your skin from the sun. Go to your doctors regularly, get your skin checked, and take care of you. Make sure you strive to live your healthiest, happiest life.